Naomi Okubo, Camouflage #3, 2017, acrylic on cotton cloth, 16×12 in. Cuchifritos Gallery and Residency Unlimited (RU) are pleased to present their seventh annual collaboration, On Illusions, featuring the recent work of Japanese artists Naomi Okubo and Kuniyasu Sakaizawa. Through two distinct practices, both artists create work that hovers along the edge of the material world and perception. Okubo’s tender images of lush landscapes animated by cartoonish details often conceal the fragile state of the female characters at the center of her work. Borrowing from the glossy and colorful aesthetics of advertising and repetitive motifs created by digital technology and mass media, the worlds depicted in Okubo’s paintings frequently deflect the viewer’s attention from the contradictions between beauty and femininity imposed on women and the vulnerabilities that are exacerbated by a need to conform. Sakaizawa’s iterative process makes similar use of the canvas, as layers of paint, applied in dozens of identical gestures, build out beyond a two-dimensional surface. Each element of the work—title, color composition, shifts in tone and texture—reveal a body of thought much larger than any single painting. Coming from Tokyo, Naomi Okubo is a painter who develops beautiful and seductive images that mask darker themes related to her adolescence and greater inconsistencies in societal norms. In 2016, Okubo received a program of Overseas Study for Upcoming Artist sponsored by the Japanese Agency for Cultural Affairs. She was selected for a residency organized by the Art Department of Halland Municipality, Sweden. Recent solo exhibitions include: THIS IS NOT MY LIFE, GALLERY MoMo, Tokyo(2016); Where should I go? Hamnmagasinet, Varberg, Sweden(2014); A dream beyond deams, H.P.F WINDOW GALLERY(2013); Tokyo Wonder Wall 2007, Skywall of Tokyo Metropolitan Government, Tokyo(2008); Selected group exhibitions: ART AWARD TOKYO MARUNOUCHI, Under Gyoko Ave,Tokyo(2011); Collaboration work: ZEIT-Magazine, Germany. 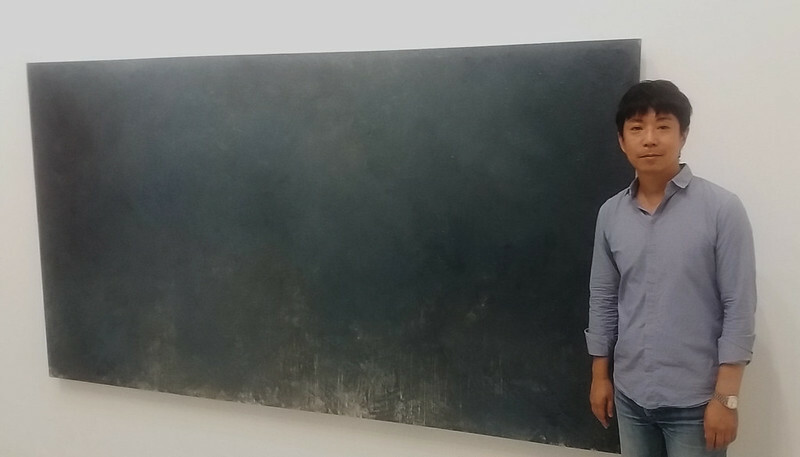 Kuniyasu Sakaizawa is an abstract painter based in Tokyo whose work is informed by endurance, action and time. In 2016, he was awarded the Japanese Agency for Cultural Affairs Grant. Selected exhibitions venues include:Kamakura Gallery, Tokyo; Nabis Gallery, Tokyo; Art Trace Gallery; Fuchu Art Museum and Musashino Art University, Tokyo. Sakaizawa is represented by Kamakura Gallery in Tokyo. RU is grateful to Cuchifritos Gallery + Project Space for hosting this exhibition. This program is made possible with the support from Japanese Agency for Cultural Affairs, Government of Japan.